I wasn't able to participate in the Silver Flash this week. I've been getting ready for the release of my Halloween story Right Street, Wrong House, available October 29th. Check out the cover on the left-hand side of my blog. Isn't it awesome? 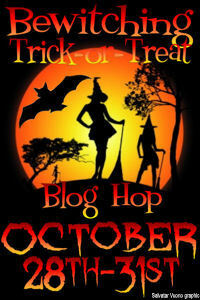 The release date ties in quite nicely with Drea Becraft's giant Bewitching Trick-or-Treat Blog Hop. As I'm one of the participating authors, I'll be giving away a copy of Right Street, Wrong House as part of the fun. So be sure to stop by between October 28th and 31st. I'll post more details on the 28th. In the meantime, for a list of the 101 participating authors (each one offering a prize) click here.